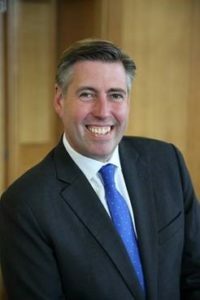 Graham Brady was born in Salford in 1967. He was educated at Altrincham Grammar School and Durham University where he studied law. Graham first became active in the Conservative party when aged 16 he joined a campaign to save the local grammar schools. Prior to entering Parliament in 1997 Graham was Public Affairs Director at the Waterfront Partnership. He had previously worked at the Centre for Policy Studies and Shandwick Plc. At Graham’s election in 1997 he was the youngest Conservative MP. In Parliament he has been opposition spokesman on employment, served as a whip and as Parliamentary Private Secretary to the Rt Hon Michael Ancram when he was Party Chairman. He went onto become Shadow Minister for Schools; PPS to Michael Howard when he became Leader of the Opposition and then Shadow Europe Minister. He continued in that role following David Cameron’s election as leader. Graham stepped down from the front bench on 29th May 2007. In 2010 he was elected Chairman of the 1922 Committee which represents the interests of backbench Conservative MPs and has continued in that position unchallenged since that date. Graham was voted Backbencher of the Year by the Spectator magazine. Graham has been a member of the Treasury Select Committee and was a Governor of Manchester Metropolitan University from 2008-11. He is patron of the Counselling and Family Centre in Altrincham and a trustee of the Jubilee Centre in Bowdon. He is a keen supporter of Stockdales, a charity supporting children and adults with learning disabilities in Manchester. He is married to Victoria with two grown-up children.